Myanmar, with a population of close to 48 million people, sits at the crossroads of Asia’s great civilizations of India and China, bordering the vast Indian Ocean and nestled next to Thailand. 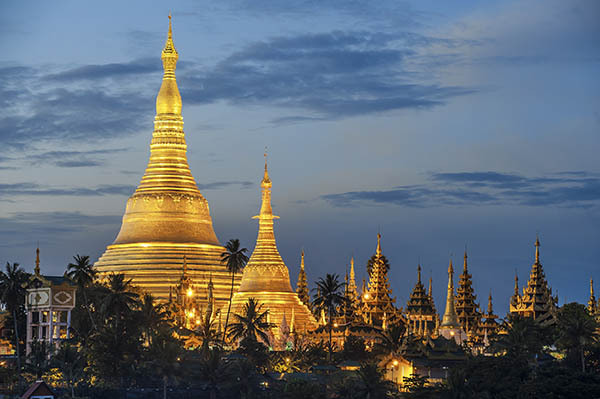 One of Southeast Asia’s largest and most diverse countries, Myanmar stretches from the sparkling islands of the Andaman Sea in the south right up into the Eastern Himalayan mountain range. To this day, Myanmar remains one of the most mysterious and undiscovered destinations in the world. It is a land of breathtaking beauty and charm with a history that spans more than two thousand years. Myanmar is rich in its heritage, much of it yet untouched by tourism. You will have the unique opportunity to work in many small villages rarely visited by foreigners, where you will be greeted with calls of "Mingalaba!" ("Welcome!") by patients eager for your care. IMR is honored to return to Myanmar for the ninth time. We began work in Myanmar after the major cyclone in 2004, where a small IMR team provided disaster relief to hundreds of patients. Since then, we have worked in many villages, towns, and cities in the areas around Yangon (formerly Rangoon) and the Irrawaddy River Delta. IMR was invited to return to provide disaster relief in the aftermath of Cyclone Nargis in 2008. On this trip, the IMR team will venture to small city communities and remote villages around Yangon. Our transportation will be left on the road as we hike in through beautiful paths to the communities we will work in each day. You will be amazed as you turn the cover to discover our clinic location and the children who will be waiting for you. Find the village swing and give one or two of them a push! You will hold clinic in small Buddhist temples, under tarps in the middle of the village, in orphanages, or in the simple homes of the people you will treat. Your patients will be in great need of medical and dental care and health education; their appreciation is unending and beautiful to receive. You will stay in a Yangon hotel with beds provided for everyone. The accommodations, while not luxurious, are safe, clean, and friendly. Breakfasts of fragrant fish and noodle soups (mohinga) will start your day off right before heading out to clinic. You'll experience many new fruits and spices while learning about the healing powers of heating and cooling foods. Ngapi and a variety of savory, sweet, and salty condiments are a mainstay of every meal. Your transportation each day will be by van and you will travel 1 to 2 hours to the beautiful villages in the countryside around Yangon. As you walk into the villages through amazingly green and thick vegetation, often on raised stones to keep the villagers dry in the wet season, you will find many children waiting on the path to take your hand. This is one of the friendliest places you will ever go and although shy at first, the children will warm up quickly and, if you are lucky, will take you to play for a few minutes after lunch or at the end of the day. Keep your eyes open and your camera handy. The villages you pass through will have beautiful temples and the countryside around you will be magnificent. Families are the highlights of this trip! You will be drawn to the families and their kind and loving ways with their children and each other; laughter is sweetest sound in Myanmar. Don't think that all is well though - there is a great deal of medical care that needs to happen here. From wound care to ear infections to pregnant women and the very old, Myanmar has something for every provider and IMR volunteer to care for. World-famous gilded Buddhist pagodas draw thousands of pilgrims every year. You will tour the notable religious sites that house Buddhist relics. The most famous, Shwedagon Pagoda, will surely be a highlight as your barefoot soles stroll the immaculate white marble structure. Enjoy a bag of freshly fried grasshoppers while the local chefs cheer you on. Pour water on the symbols representing the day you were born to avoid misfortune while visiting a Buddhist temple. Enjoy the amazing traditional markets for an authentic experience of culture and shopping. Contribute to their economy by supporting the local sand painting artists or bring back your own jars of thanaka paste for a cooling, skin-clearing face mask. Take advantage of several excursions through an extended stay, which IMR can help arrange for you. Feel as though you have truly time-traveled as you arrive in the northern city of Bagan, greeted by a horse and cart to bring you to your guesthouse down desolate dirt roads. Rise early and rent bicycles to journey through the sprawl of pagodas; find your favorite one to climb, and wait as the sun emerges to expose the wonderland of temples populating the skyline. Glide through the mountain-nestled Inle Lake as you pass fishermen, floating villages of schools and homes, and hardworking villagers weaving silk scarves and hand-rolling cigars. Stop at a market filled with genuine silver, and savor lunch on a floating restaurant where you can sample the fermented tea leaf salad. Mountain fans can catch a break from Myanmar’s heat by heading to the town of Kalaw to join a guided trek. You and the team will fly into the Yangon International Airport in Myanmar on April 27th and transfer to your hotel in Yangon. The required arrival to your hotel is 5:00pm on April 27th with a team dinner at 7:00pm. If you have the time - take a walk and explore Yangon! If you are flying on an IMR group flight your airport transportation will be provided for you. If you are traveling independently, please contact the IMR office to arrange a transport or take a taxi from the airport. Your hotel information will be provided to you after you join the team. Wake up to breakfast provided to you at the hotel and prepare for your team orientation! Your team leader will assign your roles for clinic, go over our clinic protocols, and further prepare you for your week of serving many communities in Myanmar. After orientation, you will be free to go into the city to explore the city and stunning temples around town. Get a good night's rest as you prepare for your first day of clinic the following day!! Wake up to breakfast at your hotel and depart early each day for the clinic sites! You and the team will venture to small city communities and remote villages around Yangon. Each patient's thanaka-painted cheeks and reserved smiles will bring a warm welcome. You will see many acute illnesses among your patients on this trip - skin infections and wounds are prevalent every year. You will also see the common illnesses of children: ear infections, eye infections, rashes, scabies, and mosquito-borne diseases are all common, as is diarrhea. You'll also see, treat, and educate about the chronic issues of today. HIV/AIDS, endemic leprosy, high infant and maternal mortality rates, malnutrition, malaria, and tuberculosis are all significant public health issues in Myanmar. Alcoholism also takes its toll on your patients. Dental disease is also prevalent with few dentists in the country and limited access and money to spend. You will hold clinic in small Buddhist temples, under tarps in the middle of the village, in orphanages, or in the simple homes of the people you will treat. Your patients will be in great need of medical and dental care and health education; their appreciation is unending and beautiful to receive. After you close clinic, depart back for your hotel and continue to take in the incredible experience of serving those in Myanmar. Enjoy breakfast in the morning with your team and then drive to the iconic Shwedagon Paya, Buddhist Temple. You will have the entire day to plan other tours in Yangon. All transportation to and from your desired tour will be provided. You can go as a team or on your own - your team will decide before the end of the week! Meet the team back at your hotel for your last meal all together! Enjoy breakfast at your hotel then bid farewell to beautiful Myanmar as you head to the airport for your international flight home. Pay 1,575 and complete your application to secure your place as a TEAM MEMBER! Pay 1,575 of the total cost by the Early Bird date AND upload/complete all of your required documents and forms receive $200 off the cost of your trip. To confirm your space on the team: Pay 1,575 of the total cost AND upload all of your required documents and forms! Unfortunately, eligibility for the $200 savings on this trip is no longer available after Jan 28th, 2019. Before Jan 28th, 2019: YES! IMR will arrange your international flight on a "group" ticket at your request! Pay 1,575 of the total cost AND upload all of your required documents and forms to be eligible to fly on the international group ticket. YES - We need your help to take IMR supply bags internationally to Myanmar! Take 2 supply bags for IMR both ways to Myanmar. IMR Group Flight: In order to qualify for the IMR Group Flight, you will need to reach 50% of the required donation on or before Jan 28th, 2019. Early Bird Special: A discount of $200 is awarded to team members who raise / pay 50% of the required donation on or before Jan 28th, 2019.